NPR: Trump’s top federal scientist dismisses ‘global warming’ as ‘Alice-in-Wonderland fantasy’ – NPR does fair profile on Dr. Will Happer! "As the story goes, Happer went to the White House and told Gore's staff he saw no evidence that the ozone hole actually was hurting anyone. Gore was annoyed, and Happer lost his job." 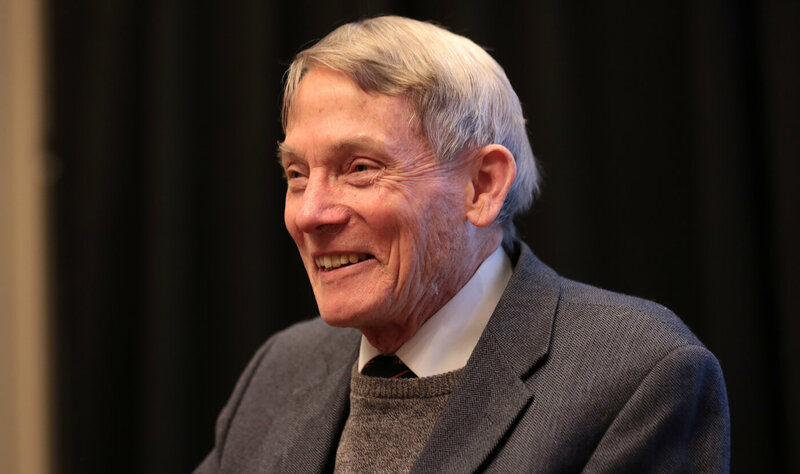 William Happer: "We've got to push back vigorously on the demonization of fossil fuels," he said in his speech. "They're not demons at all. They're enormous servants to us." At the time, in 1993, the Princeton professor was taking a break from academia to direct scientific research at the U.S. Department of Energy. He turned a skeptical eye toward one of then-Vice President Al Gore’s favorite issues: the risks posed by chemicals eating away at ozone in the stratosphere and letting in dangerous ultraviolet radiation. As the story goes, Happer went to the White House and told Gore’s staff he saw no evidence that the ozone hole actually was hurting anyone. Gore was annoyed, and Happer lost his job. Today, Happer is back in the White House, still fighting against what he considers unfounded claims that our globe is in danger. But this time, his cause is backed by the man in the Oval Office. Happer, 79, joined the staff of President Trump’s National Security Council last fall. And according to documents first leaked to The Washington Post, he appears to be pushing the White House to mount a challenge to the government’s official assessment of climate change, which calls climate change a serious national security threat. The four Democrats called it “deeply concerning that Dr. Happer appears to be spearheading” that effort. Happer is an intriguing and controversial figure. He was born in India when it was a British colony, the son of a Scottish military officer and an American medical missionary. His mother, with young Will in tow, spent part of World War II working as a physician at the secret Manhattan Project site in Oak Ridge, Tenn. The family later settled in North Carolina. Happer became a physicist. He taught at Columbia University and joined the faculty at Princeton University in 1980. One of them made it possible to capture much better images of people’s lungs; the other allows astronomers to see the stars more clearly. At the same time, Happer acquired a reputation as a contrarian, quick to challenge conclusions that struck him as unproven — especially when it came to environmental science. Koonin thinks Happer was doing what a scientist should, demanding better evidence. “I think it sensitized him to the squishiness, if you will, of a lot of the environmental science,” he says. Some of Happer’s scientific critics, though, see it as something more: a visceral distrust of scientists who study environmental risks. Over the past decade, Happer has waged a fierce campaign aimed at debunking fears of global warming caused by emissions of carbon dioxide and other greenhouse gases. Carbon dioxide is actually good for the planet, Happer says; it’s like fertilizer and makes crops more productive. Some of Happer’s colleagues at Princeton are reluctant to talk publicly about him; it’s like discussing a relationship that got messy. “I mean, I liked him. We went off for coffee after our committee meetings a couple of times,” says Michael Bender, an emeritus professor of geoscience and climate researcher. Happer, who last fall went to work in the White House as a senior aide to the National Security Council, wasn’t authorized to comment for this story. “I think the environment in general, and climate change in particular, is an area of Will’s irrationality. But nonetheless, I think he can accomplish something” in his current job, Socolow says. Socolow hopes that while in the White House, Happer will behave less like an argumentative physicist and more like the kind of person who has to prepare for every possibility — including those that strike him as unlikely. “A military person doesn’t underestimate the enemy. A business person doesn’t underestimate the competition,” Socolow says. And even if, as Happer insists, there’s uncertainty about the course of climate change, the U.S. can’t afford to underestimate those risks.